This dialog appears when you have selected a design file that has multiple parts in it or when you are exporting entities to an existing file. The dialog may appear with only a single list, or it may appear with a list and a field above the list as shown below. 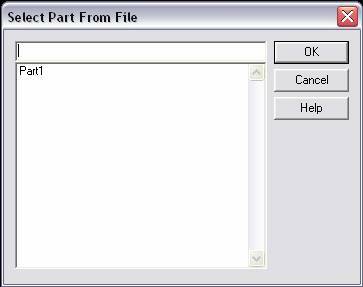 If the dialog appears with just a list, you can only select an existing part. If the dialog appears with a list and an edit field, you can select an existing part in the list, enter the name of an existing part in the field, or enter the name of a new part in the field to create the new part. Note that, when exporting entities, selecting an existing part will cause that part to be replaced with a new part containing the exported entities.